This has been out since yesterday and should hopefully have been seen by everyone who's going to vote in the Auckland local body elections. Just in case you haven't though, go here. 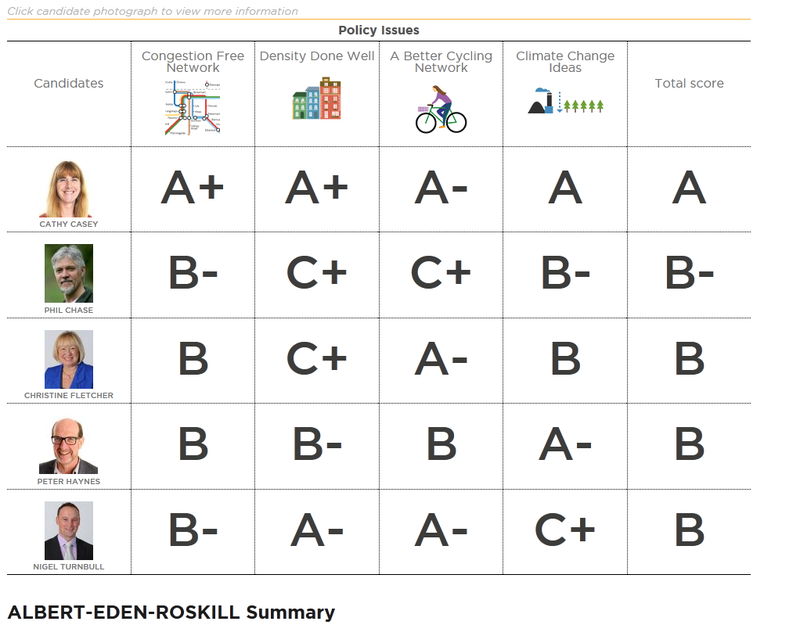 It's a scorecard for the candidates for Mayor and Auckland Councillors. Sadly it doesn't go down to the level of community boards, but that would have been a huge task. we should be grateful to the folks of Generation Zero for even this. For the record, I tend to pretty much agree with the political outlook of Generation Zero in as much as I think intensification, transport, sustainability, climate change and the like are all important, things that our politicians should at least have some form of plan for. I'm told by the one person I know with the gumption to stand in the local body elections that Peter Haynes responses didn't do justice to his actual positions - i.e. that his ideas align more towards the Generation Zero ideals than would otherwise be indicated with his grade. 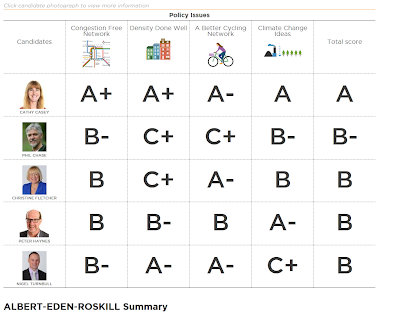 The one ranking on this that surprised me was that of Penny Bright in the Mayoral contest. I don't know much of her apart from the fact that she is an activist, generally speaking, on the left of the political spectrum. I can only presume that she didn't think Generation Zero were sufficiently important to respond properly to. Quite surprised. So I've recently had a little setback wherein the samples I've gathered and been attempting to process for the past several months (nine, start to finish if I'm counting correctly) aren't fit for purpose. I can get perfectly good RNA out of them, but not RNA that is sufficiently good for sequencing. Unfortunate really given that that's the entire basis of the data for my PhD. And that I need a good time course of host/pathogen sequence data around which to build my models. No worries! apparently. Just go and get some datasets from other studies that have been published and use them to build your models! This has been suggested to me several times over the past year or two. Each time I've dutifully gone off and looked for some of these magical published datasets. I've even gone searching a few times when no one has suggested it. The only difference I found last time I went searching was that I actually found a relevant study with published data. I use the singular deliberately there. One. This one, if anyone is particularly interested. There are institutions like NCBI that are collecting a large amount of data. Sequence data, protein structure data, metabolomic data. There are 13 databses focused on RNA listed by Wikipedia, but most of them are specialised on specific subsets of RNA - not the transcriptome in it's entirety. One thing I think we forget though is that even though we're collecting large amounts of data, the amount of data generated by biologists in last decade or two is significantly larger. Which means that even if there are people working on similar topics, there's a decent chance that the data is either a) difficult to find or b) hasn't been published in the first place*. The other possibility that springs to mind is that there just haven't been many experiments of the sort that I am doing that have been done. One of the things that I have slowly gotten used to over the past year or two is the realisation that a lot of the work that I assume is fairly basic for understanding biological systems just hasn't been done. There's so much of it, it's only been possible to study whole systems as a whole fairly recently and there's a distinct lack of both money and people to do the work. So when I go out looking for host/pathogen sequence data in plants, even though the conventional wisdom that seems to have seeped into the scientific mindset is that there is plenty of data out there, I find one useful example. So much to do, so little time (and money). *Approaches like that proposed by the DNA Digest group will I think be quite useful in opening up access to the masses of data that's been backed up and then then not used on thousands of servers around the world. Fingers crossed. There were a few good talks on day 3 - I didn't get a chance to write about any of them yesterday because it was almost straight from the conference to the conference dinner and then home late. On the plus side, a couple of late nights appears to have got rid of the jet lag. Now I'm just tired. The best talk thou, was a surprise. Literally, the speaker, Chris Voigt, hadn't told anyone what he was going to be talking about. In the end, he was talking about the nitrogen fixing system in plants. Or at least in some of them. Some who know me, know that I'm liable to occasionally go on a rant about growth and sustainability. As in we're growing, we're not going to stop it, it we need to control it and grow sustainably, especially when talking about feeding the word. Screw organics, it's a badly defined industry that isn't necessarily sustainable. Or even necessarily good for the environment. On the other hand, some of the industrial level farming that we currently do is not sustainable. Referring particularly to the large amounts of fertiliser that we produce and use. Why do we use so much? A lot of the plants that we grow for food, like grains etc, need nitrogen and they get it from the soil. They don't fix nitrogen out of the air. Some crops do, like legumes. Solution? Gt everyone to eat more beans. Good luck with that. Another option, take the nitrogen fixing gene complex out of a plant that has it and put it into some of the plants that don't. Bam, there goes our need for large amounts of fertiliser. It's not that simple though, the complex of genes that regulate the nitrogen fixing process are, to be frank a mess. Evolution does't necessarily find the optimal solution, it finds a solution that works. So Voigt's group took the complex out of Klebsellia - a bacteria that fixes nitrogen and have been re-factoring it. Re-factoring being a software engineering turn for taking something that doesn't work on a new platform, stripping it right back and building it back up again. It's a fairly complex system of 16 genes that are very much prone to stop working when there are minor changes in translation levels. They stripped out all the regulatory elements, even made a whole bunch of neutral mutations in the codon codes to remove any internal regulation and started modelling and experimenting with re-writing the regulatory process so that they would have a robust system that they can then put the whole shebang into a new system and get nitrogen fixation where previously, there was none. And they've done it. They've gone from the base Klebsellia fixation system, essentially re-written it and put it into E. coli. It doesn't operate at the same efficiency (about 70% atm) but it does work. So a while before it gets put into plants and solves our fertiliser problems. Good idea though. And the work that they done to figure out how to control a specific system is quite frankly, superb. Definitely goes to one Soren Vedal. And not just because he gave one of the two talks that came in under time - seriously, is it me or a cultural thing or something else entirely that makes me hate it when speakers go over time? It's not that they haven't know for several months how long their talk should be and haven't had time to practice. It wasn't terribly problematic today, but still. Anyway. The talk was in the session about temporal phenomena on a biological time scale. It communicated a system level concept, cleanly and efficiently in an engaging manner. Suppose you had a population of bacteria. At the population level (definitely not the individual level) it makes sense to sacrifice some of your, less fit populace, so that there are more resources for the better adapted to survive. This being a basic trade off called hedging your bets. This can be improved upon though. When bacteria divide, they don't divide evenly. A disproportionate amount of any damage that a bacteria may have suffered is shunted off into one of the two offspring. This results in one bacteria in better shape and more able to reproduce than another. Which in the longer term means taking less time to replicate and the proportion of undamaged cells increases. More environmental pressure exacerbates this effect. It is basically diverting you damage that a population suffers off to into a redundant evolutionary side track and out of the population. The average damage goes down and the population growth rate also slowly increases. Which is better than static bet hedging. And all backed up with experiments that fit the predicted patterns. Nice theory. Nice system. Well communicated. It's been a good day. Technically, my knees are still working after being treated to a superb dinner at a strangers house (friend of a friend I've never met before, I was delivering parcels, wine was exchanged in large quantities). Another drink or two though and I would have been seriously wobbling one the way back to the hotel.maybe being up this late will cure the jet-lag. Fingers crossed. The talks at ICSB were almost all interesting. Which is not to say that the few that weren't were bad talks, just sufficiently outside my area of interest so as to me unable to hold my attention. Which is to be expected. There were a couple of people that I semi-ran into in the foyer who I would very much have liked to have sat down and chatted do, which circumstances did not permit me to do so. Again, not to worry, with any luck I'll be able to find them tomorrow. The big thought for the day though is that while the talks were interesting, they weren't, generally speaking, what I would call systems biology. They might well have used various aspects of systems biology to come to the conclusions that they did, but in primarily presenting their conclusions, it felt to me like it was more of a molecular biology conference. The talks weren't, for the most part, systems biology as I understand the term. I may very well be wrong about this, it might very well just be the selection of talks that I have seen. Or it might very well be that my perception of the field is somewhat distorted having come from a somewhere without a strong systems biology community. As it stands though, the first full day of talks was interesting but not what I'd been hoping for. Some of the talk titles in later sessions indicate that we may very well be in for more systems focused talks though which would be a good thing. And now, to bed. Before I fall asleep at the keyboard. Naughty friends of friends, feeding me and taking me to bars with beers called spymaster and evil twin hipster.